This story is shared courtesy of the Salmon Press and reporter, Randolph resident, and former Randolph Community Forest Commission member Edith Tucker. RANDOLPH — Most residents of this small town are just now learning in this season of giving that Roberta Arbree and Bob Potter have recently given the town a wonderful gift that they had the foresight to pursue and orchestrate. The couple donated $61,500 to the Conservation Commission in September so that it could buy a 72-acre parcel and an access right-of-way on the south side of Route 2 that includes Rollo Fall on the headwaters of the Moose River, set in a rugged forested landscape. From the outset the couple has intended that the Conservation Commission would act, in essence, as a pass-through, with the tract being added to the 10,000-acre-plus “working” Randolph Community Forest, once that step is approved at the March 2015 town meeting. The selectmen approved having the town accept the deed on Nov. 11, as they had committed to on Sept. 22. The tract is unsuitable for housing development since it has no frontage on a public road, noted Conservation Commission chairman Bruce Kirmmse in the property description he prepared for the selectmen. The shortest access would require the use of an old logging road that is more than 800 feet long, which is longer than the town permits, he pointed out. Furthermore the ROW to the parcel crosses the White Mountain National Forest, and, by legal stipulation recorded in the deed, it cannot be improved or paved. Bob Potter and Roberta Arbree of Randolph donated funds earlier this year to the Randolph Conservation Commission so it could buy a 72-acre parcel from Coulter family members on which Rollo Fall and the headwaters to the Moose River are located on the south side of Route 2 near Bowman Divide, to add it to the Randolph Community Forest (RCF). Voters will be asked to approve adding the parcel and an access right-of-way to the RCF at the March 10, 2015, town meeting. Photographer Scott entered this photo into the 2014 art show, held annually at Randolph Town Hall. When Roberta and Bob were asked why they decided to buy the tract to protect it from development under public ownership, they cited the same fundamental reason, the preservation of the Moose River, but cited different experiences. “My first sighting of Rollo Fall was when I was hiking with Gail Scott to look for it,” Arbree replied. “She and I found the site together.” It’s only about a half-mile from Bowman, the height of land in Randolph between the Androscoggin and the Israel’s River watersheds, and it is on nearly level terrain except for the final 100 feet or so. Its existence is marked on a number of maps, including the 1928 Louis F. Cutter map of the Mt. Washington Range; the Lowe’s Path, when it began at Bowman, used to pass Rollo Falls. It is on Brad Washburn’s 1988 map of Mount Washington, and it’s mentioned as a bushwhack in Bruce and Doreen Bolnick’s “Waterfalls of the White Mountains” (1990). “But what really galvanized us is that the headwaters of the Moose River are on the property, and we want to protect as much of the Moose River as we can and encourage others to do so,” Arbree explained. “We’ve already conserved one mile along the Moose River in Gorham and Randolph.” In that prior 245-acre project the couple bought land destined to be a gravel operation and placed conservation easements on it. 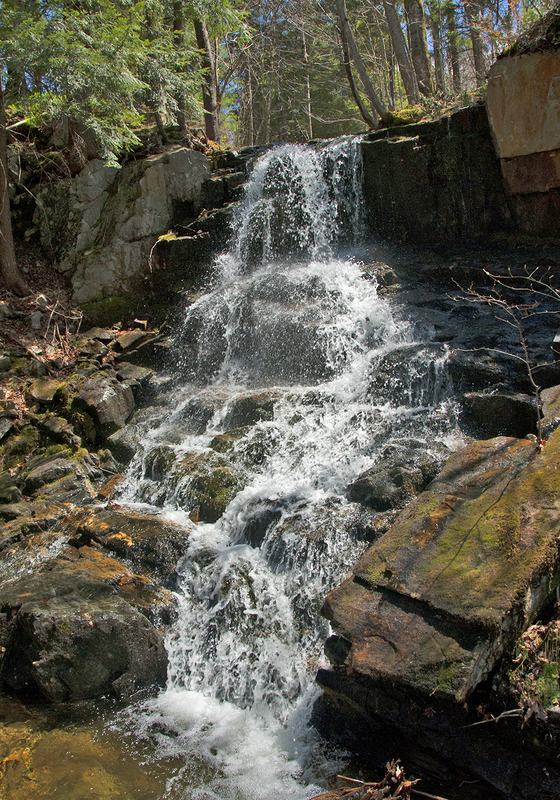 “We were also captivated by the waterfall, and its historic significance,” Arbree continued, pointing out that author Dr. George N. Cross describes Rollo Fall in ‘Randolph Old and New’ (1924) as the location of a Randolph Mountain Club picnic. “We’re hoping that the Randolph Forest Commission will restore the picnic spot and that it will be used by hikers and local residents. Potter’s lifelong connection to the Moose River involves a lot of fishing. 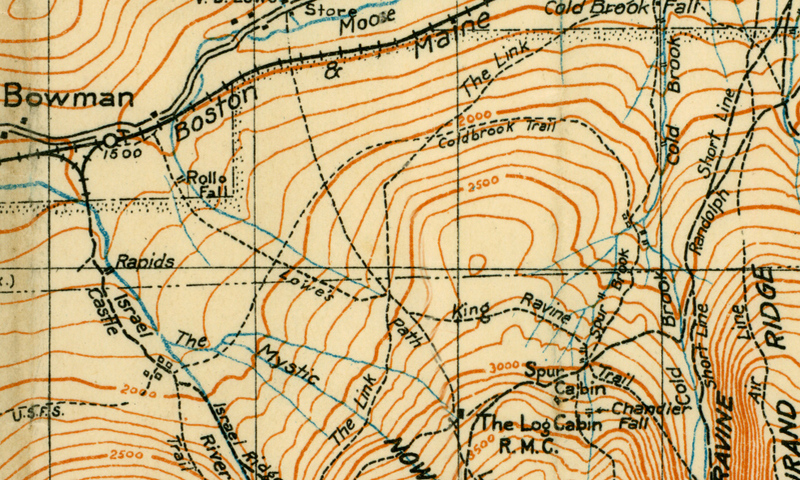 The Lowe’s Path, when it began at Bowman, used to pass Rollo Falls, as shown in this detail from Louis F. Cutter’s 1928 map of the Mt Washington Range. Courtesy of Judy Hudson. “I began my long life of trout fishing on the Moose from the time I was eight years old. I took my brother Tony, four years younger, with me when he turned eight. Together we ranged as far as the old Pinkham B Road bridge (then called the Dolly Copp Road bridge) from our home in Gorham, catching many fish — mostly native brook trout and rainbows. The legal limit then was 15 trout or five pounds. We even caught land-locked salmon. Trout were a major part of our diet during Word War II, and we both learned to fly fish on the Moose. “All five of my children were brought up fishing on the Moose and, like me, learned to fly fish there.